While it’s fairly easy to read an ebook on your iPad or iPhone, doing so on the Mac has proved more difficult. 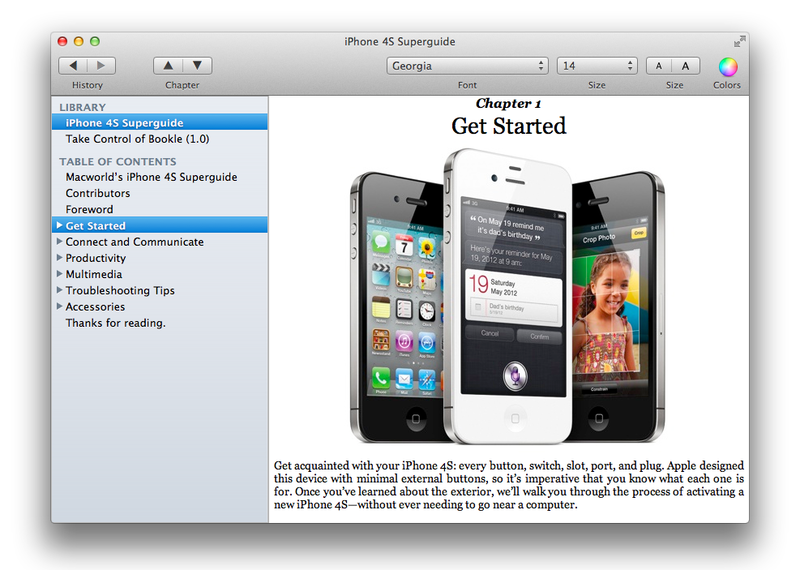 Apple offers no Mac version of iBooks, and dedicated ePub reader apps for the Mac have only recently surfaced. Bookle (Mac App Store link), created by Stairways Software with help and input from Tidbits Publishing, is the latest offering to hit the market, and it aims to provide users with a way to read and store their ePubs. With regular ePub files, however, Bookle works very well. You open a book—and simultaneously add it to Bookle's library—by dragging the book onto the app’s Dock icon or by choosing File -> Open. Bookle makes a duplicate of the book in its library, providing easy access to it in the future. The app also saves your place in each respective book you open. Underneath the library list, the app displays any chapters and sections within the current book; you can jump to any of those by clicking. Like fellow ePub reader Murasaki, Bookle has a scrolling interface, rather than iBooks’ variable page flow: Each chapter is represented as a scrolling page; to advance, tap Spacebar or Bookle's chapter advance button (on the toolbar). You can also switch between chapters using a two-finger horizontal swipe. When reading, you can customize a book's font face, font size, and background color, though initially the book’s stylesheet will be loaded by default. And each book requires separate customization—you set your preferred font and font size across the board. I loaded several books into the app, including simple novels, books with only a few pictures, and feature-rich titles like our own Superguides. All rendered just as they would within iBooks on an iOS device—sans page breaks, of course. Overall, I’m impressed by Bookle’s initial feature set, but there’s still plenty of room for improvement. Currently, there’s no way to search through a book or to add annotations, though according to Engst, these features are planned for a future update. Additionally, the developers are actively seeking feedback from the community for upcoming versions. My only other concern relates to Bookle's $10, which feels steep for a basic reader, especially when compared to competitors like Murasaki ($5) and Calibre (free). With any luck, however, improvements to Bookle will soon justify this premium.